Monitor occupancy: how many people are currently in the building and in each room? 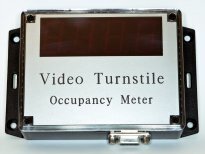 Occupancy can be shown in meters and on PCs. Count customers by time period: number of people per hour or half hour for example. Daily count files can start from your opening time. Accurate, reliable, counts using CCTV cameras and intelligent, networked, counting units. Find out more: get a quote or send us an e-mail.